Improve your church communications (and reduce your workload) by integrating your Church Community Builder and PastorsLine accounts. 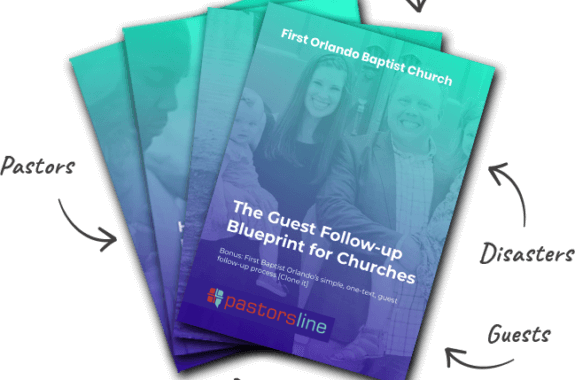 Integrating PastorsLine and CCB gives your church improved communication and better relationships with your church members and first-time guests. Integration also reduces your workload. CCB. You have already captured important data. 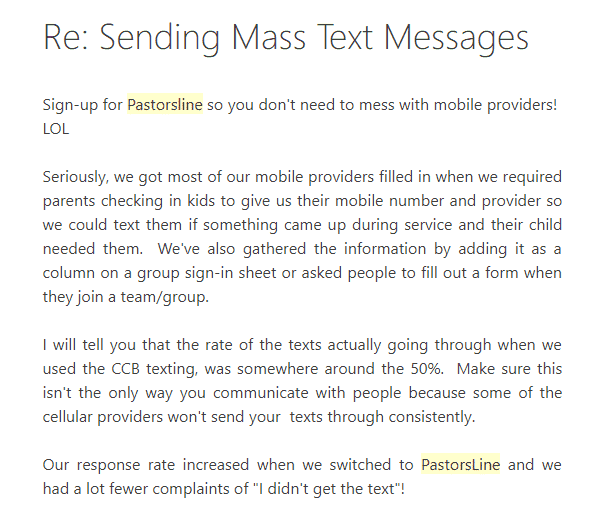 PastorsLine, it is captured via text message—easier for you and your subscribers. So, capture the data on PastorsLine and send it back to CCB. that info into a CCB group immediately. E.g. 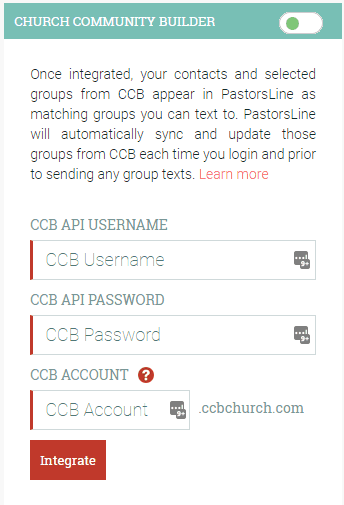 You will be able to sync some or all of your CCB groups to PastorsLine. NEW! 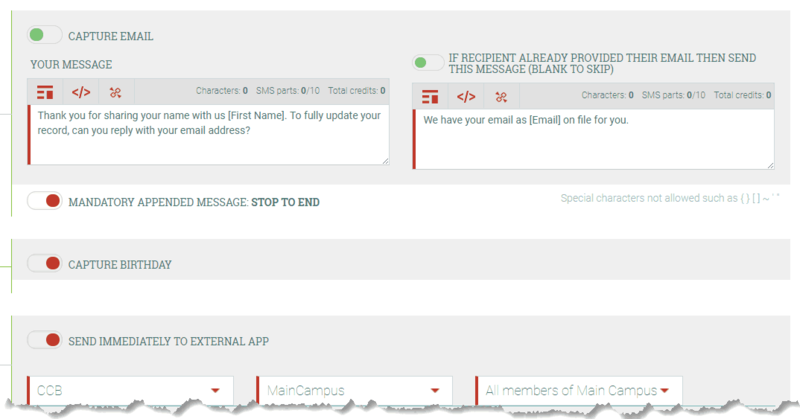 We have created a way for you to use our data capture feature (FKA autoresponder) to capture the data of your members and guests who text into your PastorsLine group, create a profile for them in CCB and put them into a CCB Process Queue. All this is done automatically just by them texting one keyword to your phone number! [The CCB sync] worked like a charm! Very impressed—a huge answer to something we’ve been looking for. I was able to send a template with a field merge by scheduling it, and I’ve loved the interface on the webpage and from my phone with the app in being able to respond. This is an immediate asset to our church and will be a game changer once you have the sub user functionality. 1 We enter all first-time guests into a process with a queue that's "Send Welcome Text." 2 We also run a search on those with member status "new from check in" from the previous weekend. We do a mass action to add those people from that search to the same PQ. (These are the new parents who checked kids in and may not have turned in a first-time guest card. 3 Once the PQ is filled for that week, I run a search of those added to that PQ and do a mass action to add them into a New Guest Text group. 4 In PastorsLine, I sync that group in PL. 5 And then send that group a text from a saved template with a merge field. 6 In CCB, I then mark the PQ done. 7 I then remove all those people from the group in CCB so it's cleared to dump new people in the next week. 8 I then sync the group in PL again. 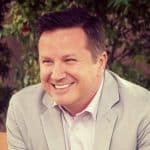 Twext™ vs. CCBtext.com by PastorsLine? Good Morning from the Pacific Northwest! We are wanting to use mass texting for a few of our groups at one of our campuses. What is the best way for us to request Mobile providers from people in our database? 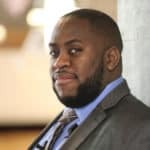 What happens if the data capture (FKA autoresponder) campaign is turned on and also connected to a CCB group? Let’s use the following example: your subscriber (407-407-4070) texts ORLANDO (the keyword you chose) to your PastorsLine # 1(407)111-2222. 1. If it’s that subscriber’s first time, we will IMMEDIATELY send that subscriber's data over to the relevant CCB group. If not, and depending on how you set up the response, we will let them know they are already connected to that group and do nothing OR override it with the new data they provide. 2. The above is sent together with the following data capture request (as one SMS), the first message being whichever data capture option is turned on. In this case, we want to capture their name next. If the subscriber (407-407-4070) provides their full name, we will IMMEDIATELY update their info to the specific CCB group. If they only reply with a single word, we will assume that's their first name and update the first name field in CCB. 3. Then we do the same for the remaining items. Each time our system will wait for a response before triggering the next step. Once received, we will immediately send that info over to CCB and send the next question (repeat). 4. You will also be able to send a final message once all the data requested is captured. Note: It's worth noting that they don't need to opt-in to be synced. If you manually add them to the group from our PL interface, those names will also sync as well. What happens when you update a CCB group that is synced to PastorsLine? If you update a CCB group that is synced to PastorsLine, we will pull in those records once you login online. You also have the option to manually sync everything as well - pulling in the latest records. Should I choose a shortcode or a long code when sending a high volume of texts? So with volume, organizations tend to use a shortcode (5 - 6 digit number and that technology) which requires a few steps to setup; with docs to sign (including ID, etc. ), setup time and costs are higher, including the recurring cost to retain the use of the shared short code. The benefit is that you will be able to send to larger groups faster. i.e. 100 SMS / sec (shortcode) vs. 1 SMS / sec (long code). So sending to a list with 3000 subscribers with the long code will take 50 minutes to complete. Another potential issue that long codes have on volume is that bulk messages using the same content in a short period (> 15 minutes) may be flagged by some mobile carriers. But here's our solution. Solution: What our system can do is rotate between several long codes (local numbers) that you own. Then we can assign 500 subscribers per number. In our example, 3000 subscribers will require 6 phone numbers to send out the weekly message you mentioned. The total time will be about 8 minutes for everyone to get the message. Was that the reason why you requested 5 numbers? If so, then that's our best solution that give you the best of both worlds (relationship building tools + volume) read more here . Since your system allows us to add several local numbers to the same account, which number should be our main number. That is, the number our audience will use to opt into our list? It would not matter. All the responses and actions comes back to the same inbox and will trigger the same auto-responses. I believe the long code benefits and solution we offer outweigh the benefit of using a shortcode (cost, time, relationship building). 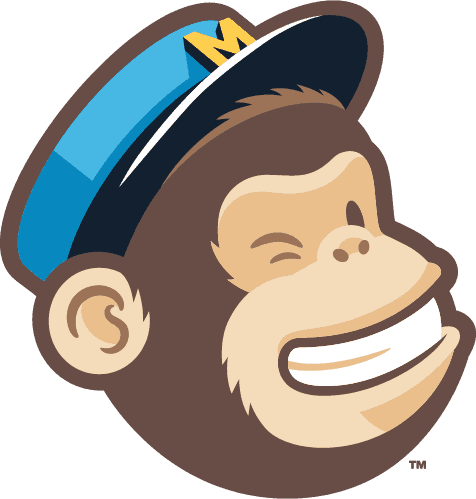 I am looking for the integration between Church Community Builder (CCB) and MailChimp? That's a different application that is powered by our team. PastorsLine processes all data securely using our SSL certificate. We also follow all industry ‘best practices’ standards regarding handling and treating data. 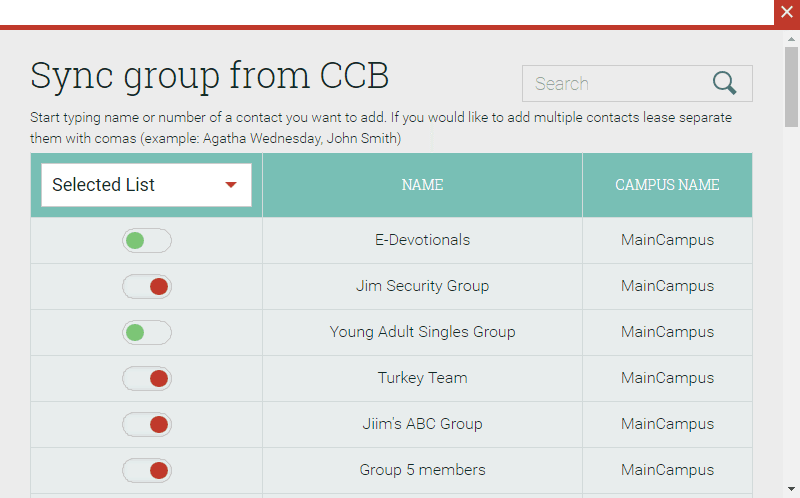 PastorsLine never deletes groups or contacts on your church’s CCB account. In addition, you can always opt-out. Your church always retains full control of your data. At any time, you can roll back the PastorsLine app in order to easily disable the CCB integration. The best news is that as your church grows, PastorsLine and CCB can continue to sync your new contacts and groups up to an unlimited number with virtually no restrictions. What our Church Community Builder (CCB) clients are saying..
Googling. Trying to find a solution that integrates with CCB. I've refused to add a separate system that requires someone to keep the information updated between the two. Stumbled onto this. Tried [TiC], but their inability to communicate to CCB was a deal breaker for me even though their product otherwise was good. 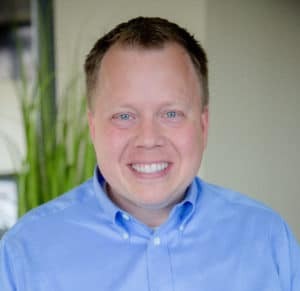 Long time CCB user, and advocate of church management systems. 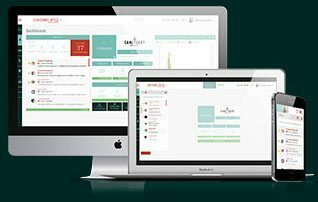 Pastorsline is the next step in fluid and dynamic church communications. Technology that allows a leader to do more with less, is always welcomed in my book. Pastorsline breaks down barriers to communication and allows the Leader to communicate effectively. *Church Community Builder is a registered trademark of Church Community Builder, Inc. All Church Community Builder products and services that we mention are property of Church Community Builder, Inc. We are a preferred partner but are not affiliated in any other way with Church Community Builder, Inc.